The Eventide Clockworks Legacy TDM bundle comes with the Omnipressor, Instant Phaser, H910 Harmonizer® effects processor, Instant Flanger, and the H949 pitch shifter. Designed to give you classic signal processors and music production tools, these Eventide plug-ins have been painstakingly rendered by the engineers at Eventide to faithfully re-create in unrelenting detail the unique character of each of these dedicated processors. Full automation and MIDI control, and control surface support have been added to take full advantage of the power and flexibility of Pro Tools. The Omnipressor (1971-1984) is a compressor with an attitude. Dubbed the Omnipressor, because it simultaneously compresses and expands, it has been widely used on hit records throughout the last 30 years. One of the first users was Brian May, lead guitarist of Queen. His tone was never the same again. The Instant Phaser (1971-1977) is the plug-in based on the very first phaser, a single-function analog processor featuring a sweeping filter bank. Led Zeppelin loved it so much, they offered to endorse the Instant Phaser. Take a close listen to "Kashmir" to hear the original in action. 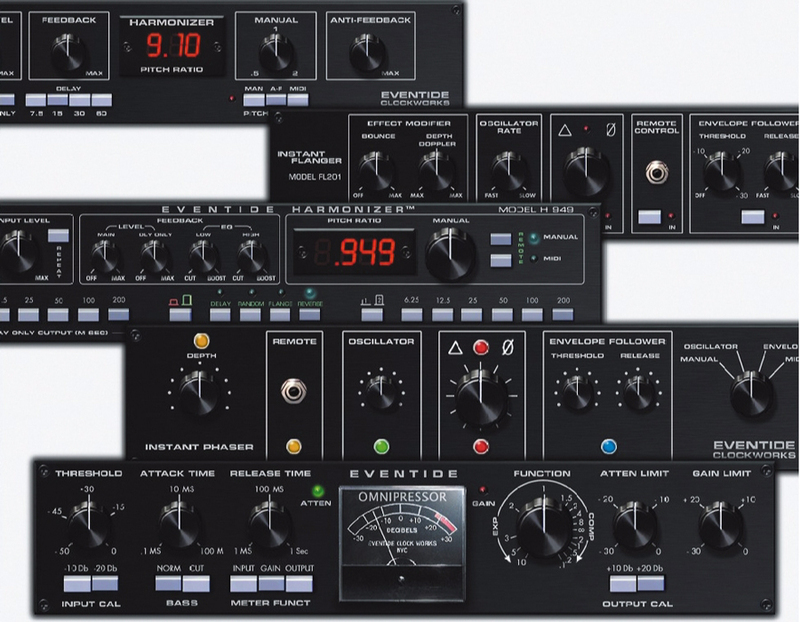 The H910 (1975-1984), is a plug-in re-creation of the very first Harmonizer® effects processor, adopted by industry luminaries like Tony Visconti who used it to create the unique snare sound on Bowie's Young Americans, Low, and Lodger. Frank Zappa used the H910 in his guitar rig. The Instant Flanger (1976-1984) is the plug-in re-creation of one of the first hardware products to re-create flanging. It provides the ability to choose or combine modulation sources together including the LFO, or input signal (envelope follower), or manual sweep, which can be controlled by MIDI. The H949 (1977-1984) took pitch changing further than ever before. This plug-in re-creates the unique random feature which creates slight variations in delay resulting in a less mechanical sound. The original can be heard on countless hit records of the last 25 years. In fact, Jimmy Page used the H949 in his guitar rig. Clockworks Legacy is compatible with TDM ProTools systems only on the following platforms.